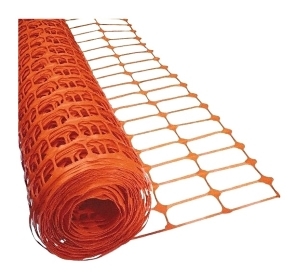 PRODUCT: SAFETY FENCE / SNOW FENCE, 4' x 100' ROLLS HEAVY-DUTY UV-RESISTANT ORANGE PLASTIC-MESH. 25 ROLLS/PALLET. PRICE/PALLET. 4-ft. high x 100-ft. long fencing constructed of heavy duty 12lb. high-density polyethylene. Ultraviolet stabilized and resistant for long-lasting durability. Strong and effective in high and low temperatures. Tensile yield is 3200 PSI. Suitable for snow control, crowd control, construction site and other heavy duty situations. Ribs are about 98 x 47mm with ribs 18 per meter x 11 per meter.